How often do you need a Char Kway Teow fix? 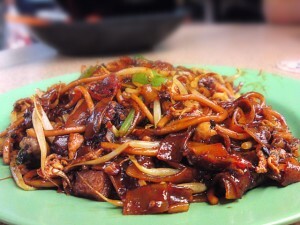 I need about once a month and my favourite Char Kway Teow stall is the undisputed king of Char Kway Teow at Bedok. Now we all know that taste of Char Kway Teow differs from stall to stall and the only thing that separates them are the sweetness, wetness and the wokheiness as I mentioned here before. It must not be too sweet, not too wet and not too ‘chao tah’ so it all boils down to the right balance of those 3 qualities. For me, the truly great ones are those that can make you complete the entire plate without needing a cup of chinese tea to wash down your oily throat, yet still can make you yearning for more! The lousy ones of course are those that can give you that ‘vomitting’ feeling. Of course we all have different preferences for taste. Some like it wetter while others prefer it sweeter. If you’re one of those who prefers it sweeter and if you happen to be staying in the east, then this Char Kway Teow stall could just do the job for you! Song Le has been around at Tampines Blk 201 for at least 20 years. They made a name for themselves by selling a lot of things but the regulars would know that they’re infact just good for 2 things. Carrot cake in the morning and Char Kway Teow after morning. The Char Kway Teow here is a little on the sweet side and ‘wokheiness’ is quite shiok. The only thing is that it’s not that wet though it is also not that dry lah. I think it could be the effect of that little more dark soy sauce but anyhow is still quite a delicious plate for lunch. Another good thing about it is that it doesn’t seems to be spending a lot of time in the wok. The noodles and kwayteows are still quite QQ(chewy) with good amount of wokheiness. Seemed like the noodles had a quick sear over hot fire with that bit more dark soy sauce or something along that line. All in all, it’s that tad more sweeter but not any wetter. Recommendation: Carrot Cake in the morning and Char Kway Teow after morning. Conclusion: The Char Kway Teow here is sweeter but not wetter. Yet ‘wokheiness’ is not compromised. Not the best but definitely one of my top 10. Can do a temporary fix if time is short. If you have more time then travel another 20 min to the undisputed king of Char Kway Teow at Bedok Blk 16. Likes: Nice sweet ‘wokhei’ flavour. Dislikes: Noodles too QQ at times(very seldom though) until almost al dente. Wa must be a hokkien place. Thanks, will check it out when i’m nearby. Sorry, i have to disagree. Song Le CWT at Tampines 201 can never make it to the top ten and not even the top hundred. It is nowhere near to the likes of Hill Sreet, Newton, Outram Park, 928 and even Apollo. Somemore have to put up with the attitude of the so called chefs. Yup. Their fried bee hoon which is done in a similar style to hokkein mee is quite good thouhg. Stay opposite only, the woman chef in the phot no longer works there, another middle age woman took over, she don’t cook well. 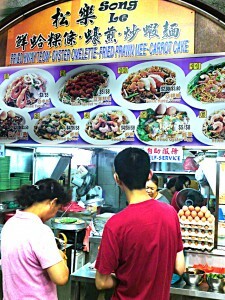 If want to eat, wait for the man in late afternoon, his hokkien mee is nice too. I love the noodle from Song Le, very nice and match my taste !! !